How beautiful are the words of Hajar (may Allah be pleased with her), the wife of Ibrahim and hte mother of Isma’il, when she followed her husband, after he had left her with her son in a valley that was not cultivated, and departed. She kept asking him, “O’ Ibrahim! Where are you going and leaving us in the valley, where there are no people and nothing?” He did not answer her, so she said: “Has Allah commanded you to do this?” He said: “Yes.” She siad: “The He will not forsake us.” Indeed, Allah does not forsake His righteous slaves. 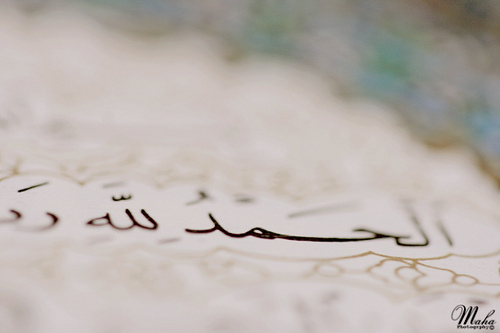 Did not Allah compensate the man and his wife in Surah al-Kahf? Did Allah not take care of thetreasure of the righteous man for his two sons, when He commanded the companion of Musa to rebuild the wall so that it would remain strong until the two boys grew up and could take their father’s treasure? ← Religion! – Your Perspective?